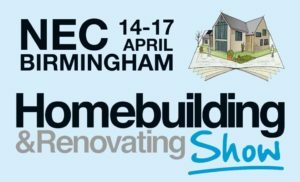 Until the doors open at the Birmingham NEC for the Homebuilding & Renovating Show! We will be on the RK Door Systems stand promoting the fantastic Aluminium Entrance Doors – with U Value ratings from an incredible 0.67 W/m2K. We look forward to meeting everyone on the 4 days the show is on for. Thursday 14th April – Sunday 17th April.